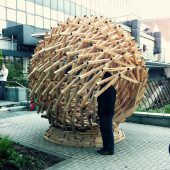 I Don’t Roll is a reciprocal parametric timber structure of 3 meters in diameter created as a collaboration between students and staff at the University of Portsmouth School of Architecture (UoP) and the Whitelands Wood Project. It was designed and built by a mixed team. It is made out of 400 meters of western red cedar timber, felled and cut using traditional methods from one tree. The cedar was coppiced from the woodland to improve the habitat of native butterflies and biodiversity of the woodland. 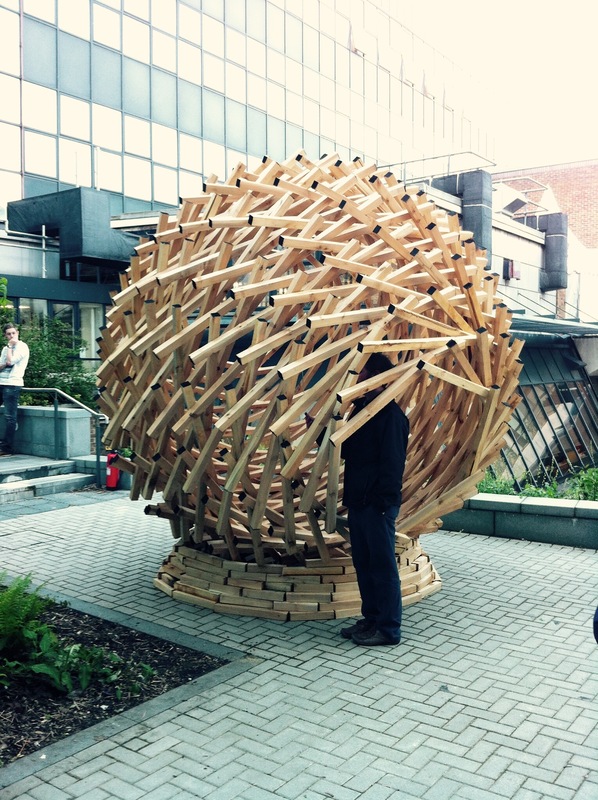 The structural form is inspired by the second place winner of the workshop ‘Structure in the woods’ @ UoP. 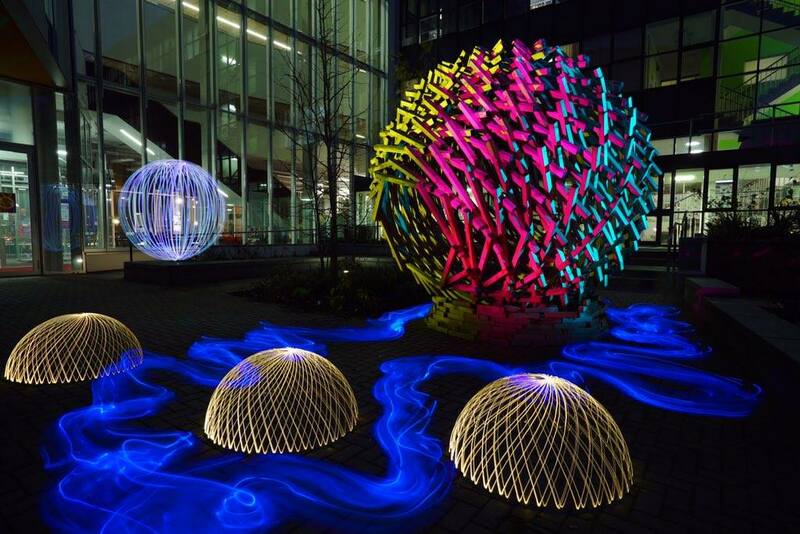 The design was developed by Guido Robazza and staff at the Portsmouth School of Architecture – Nicola Crowson and Phevos Kallitsis, in collaboration with woodman Jonathan West. 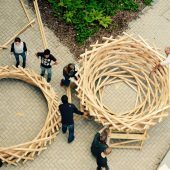 The structure is reciprocal as every piece of timber lies on the next, which makes the structure self-supporting and parametric due to its geometrical form. The form is determined by a set of parameters such as number of tiers, rotation angle, and thickness of timber section. Changing one parameter, changes the whole structure. 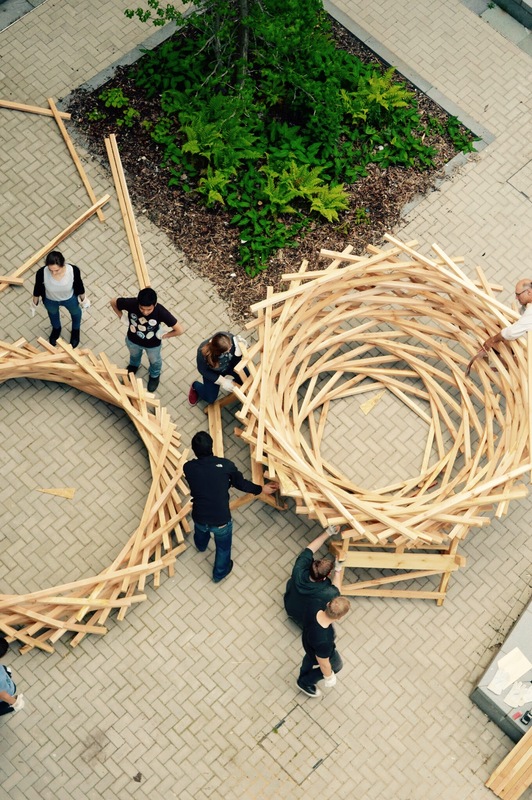 Test a model of collaborative designing and making. The model proposes to create the design through a democratic, shared and collaborative method, where all the involved students propose ideas and decide which idea should be taken further. 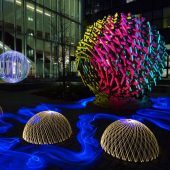 Design a structure that is both reciprocal and parametric. Reciprocal means that every piece of timber lies on the next one, offering structural stability. Parametric means that the design is achieved through the variation of parameters such as: number of sides for base shape; timber thickness; rotation degree; number of tiers; overall diameter. Test how locally sourced green timber (from a single tree) can be used for construction and review the green timber over time to determine any structural changes. Green timber dries in time and this provokes shrinking and bending. Although we can define this alteration on a single piece of timber, with this project, we are able to investigate what changes would happens when the pieces were solidly joined together and what would be the impact on the joints? Understand how a co-creation process leads to a great level of engagement, creating a social legacy for a small group of people. Can a collective achievement create a strong social bond between the participants? Is this also true for a ‘design and make’ project set within an educational context?